“Take A Chill Pill And Relax…” Does this sound familiar? Do you often hear people saying this to you? If so – you’re not alone! Over 40 million Americans suffer from stress and panic attacks. And it can happen to anyone at any time! He’ll probably tell you that you’re stressed – and write you a prescription for an anti-anxiety drug. He might even say that you’re depressed – and once again, whip out the prescription drug pad for an anti-depression drug…or maybe even, you’ve got insomnia – and, well you know the rest. Out comes the pad for a powerful sleep drug! But your doctor will probably NEVER tell you that you may have a nutritional deficiency that’s contributing to your body feeling out of control. Most folks are when they discover that their stress… low moods… and even sleepless nights can be caused by imbalances that can be supported naturally. One of the important brain chemicals that can easily get out of balance and create chaos with your mind and body is serotonin. It’s called the “feel good” neurotransmitter because serotonin is responsible for balancing your mood, emotions, appetite and sleep patterns etc. So can you see how your body can go haywire when serotonin is out balance? And the reverse is true…when serotonin levels are in balance – you can cope with life’s stresses without getting overwhelmed! So how do you get your serotonin in healthy balance? Neuro-Natural Serenity may help support healthy serotonin function. This special stress-relieving and mood-supporting formula contains 43 active ingredients that are designed to work synergistically. Neuro-Natural Serenity contains many potent nutrients to help you support your brain health and healthy mood. If you need additional support to cope with bouts of stress… low moods… and manage frustration – Neuro-Natural Serenity may just provide the support you need. For example, vinpocetine which is an extract from the lesser periwinkle plant (and very expensive) provides many benefits to the brain by helping chemical signaling between nerve cells and improving the use of oxygen by the brain...thus improving the availability of energy. These ingredients have been combined in a synergistic way! In other words...they are designed to work together to provide optimum benefit. How is Neuro-Natural Serenity different from the other Neuro-Natural products? Two such herbal extracts are Valerian root extract and Hops...Valerian root extract has been shown to help support low mood disorders, stress and frustration....while Hops may help relieve feelings of nervousness and irritability. What makes Neuro-Natural Serenity so effective? Neuro-Natural Serenity also uses enteric-coating technology which ensures that the beneficial nutrients aren’t destroyed by stomach acid...reaching the upper intestine intact to be absorbed by the body...resulting in optimal efficacy. We acknowledge and appreciate the fact that Neuro-Natural Serenity is an expensive product...we’ve done our best to keep the cost as low as possible... However, when compared directly with other products and their ingredients, Neuro-Natural Serenity represents exceptional value for money...in fact, we guarantee that you won’t find better value anywhere else from a natural stress relieving supplement. For even greater stress and frustration relief and serenity... you can take Neuro-Natural Serenity in conjunction with Omega 3 / DHA Fish Oil. Can be taken with any other Neuro-Natural product for a full dose of 6 tablets a day (E.g. 3 tablets of Neuro-Natural Serenity with 3 tablets of Neuro-Natural Sleep). Combines well with our Omega 3 Fish Oil products, Kiwi-Klenz and Total Balance. 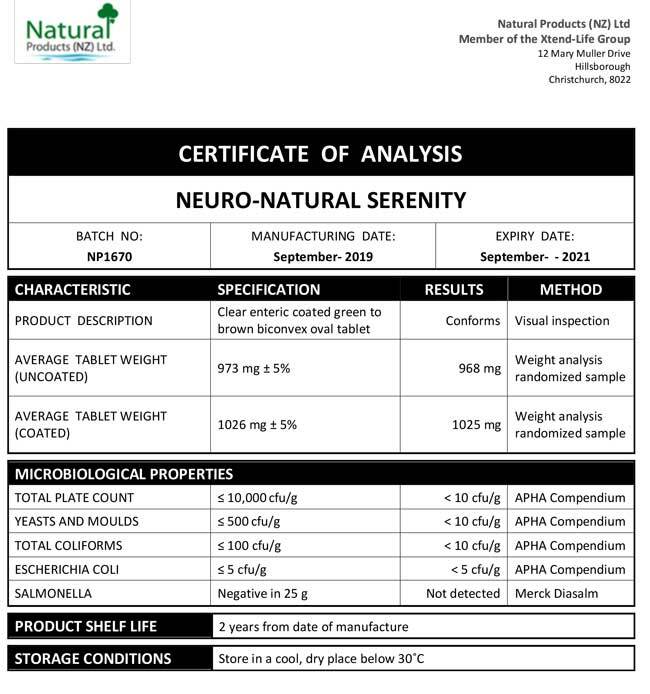 We have included below a copy of a typical Certificate of Analysis (CoA) for our Neuro-Natural Serenity product. You will note that there are two columns which are headed 'Specification' and 'Results' respectively. The specifications are simply our minimum standard to which each batch of Xtend-Life Neuro-Natural Serenity has to conform, otherwise we would not release it. The results are the actual results from the independent laboratory that did the testing. What benefits could I notice from using Neuro-Natural Serenity? Neuro-Natural Serenity may be able to help you achieve more satisfactory rest and a more positive mood. It aims to do this by supporting the healthy function of the neurotransmitters in your brain and nervous system in a completely natural and relaxed way. This product may help you to better cope with the mental and emotional effects caused by stress and anxiety, whether this is on a short-term basis or chronically. Neuro-Natural Serenity may help to calm the nerves, quiet the mind and enhance energy levels. What is the recommended dosage for Xtend-Life Neuro-Natural Serenity? Daily Serving: Adults - 6 tablets. Age 12 to 18 years - 3 tablets. If you have any questions, please contact our customer support staff. Combines well with our Omega 3 Fish Oil products, Total Balance and Kiwi-Klenz. Can I give Neuro-Natural Serenity to my child? How can I get the best results from using Neuro-Natural Serenity? To see the best and most rapid results we suggest that you follow our guidelines found under the 'Directions' tab, in conjunction with adequate physical exercise to oxygenate the body and mind, and a healthy, balanced diet. The recommended dosage for optimum results is 6 tablets per day. Ideally, this should be combined with 2 soft gels per day of our Omega 3/DHA Fish Oil if you are able. Total Balance can also be added for the ultimate support and wellness. There are 90 tablets in a bottle therefore, two bottles would be required for a six tablet dose. Alternatively, you can take anywhere between three and six tablets per day. Will Neuro-Natural Serenity help to support my anxiety and panic attacks? Yes, it is possible you will notice a difference. Stress and frustration are part of the mental states that are associated with low moods and neurological imbalances. Neuro-Natural Serenity supports our natural neurological balance to establish calm and clarity in thinking as well as rest and relaxation. It is important to take some quiet time each day, even for 5-10 minutes. Please seek independent medical advice if your panic attacks or anxiety worsen, or you feel unable to cope. Is Neuro-Natural Serenity the best Neuro-Natural product to support my poor concentration that is caused by a low mood? If your main focus is to support your mood Neuro-Natural Serenity is the best product for you. This product may help you to better cope with the mental and emotional effects caused by stress and anxiety and in turn, lift your mood. However, if you feel that your low mood is affecting your ability to concentrate you may use Neuro-Natural Recall at the same time, taking half a dose of each product. You could take half the dose of Recall before lunch and then a half dose of Serenity in the afternoon to target both concerns. As well as taking Neuro-Natural Serenity, what else can I do to help support my emotions and stress or anxiety levels? It is important to ensure you address any emotional factors that may be in part a contributor to your current issues. This can be done through talking with friends and family and seeking professional help when necessary, from a counsellor or psychologist. It is important that you speak with your doctor if you are struggling to cope, as they can refer you to an appropriate service. Exercise is also very useful for supporting low moods. It is proven to increase serotonin levels and encourage the healthy flow of oxygen-rich blood to the brain. This may help to keep mood disorders at bay and enhance the emotional state overall. Furthermore, nutrition is of paramount importance and it is essential to ensure that, along with an excellent professional supplementation regime, a good healthy diet is maintained. Many studies have shown that diet has a huge impact on the way we feel emotionally, mentally and physically. Eating as many fresh whole foods as possible, plus pure water is a great start. Is it beneficial to use Omega 3 fish oils, as well as Neuro-Natural Serenity to support my depression? Omega 3 fish oil extracts may help support low moods, which is why we recommend this product to address this concerns. However, to offer a more comprehensive and effective protocol we would highly recommend adding Neuro-Natural Serenity as well. Neuro-Natural Serenity contains very specific ingredients (many of which are often left out by other supplement companies as they are expensive to include) to deal with low mood and stress. For example, SAMe supplementation helps with changes in neuronal membrane fluidity, facilitating signal transduction across membranes and increasing the efficiency of receptor-effector coupling. Our Neuro-Natural range has the advantage not only of having this, but many other very specialist ingredients included as well. It is also enteric coated, thus ensuring that the vulnerable ingredients are not damaged by stomach acid, and are optimally absorbed in the upper intestine. Why should I select Neuro-Natural Serenity over the other three versions? Neuro-Natural Serenity concentrates on addressing your state of mind and stress levels. If you find you are suffering from negative thoughts, low mood, or stress then this formula may help. It contains specific ingredients such as Valerian, for example, to support stress relief, lack of sleep and frustration often associated with low moods. Valerian contains constituents called valerenic acids which are thought to affect GABA receptors (gamma-aminobutyric acid). GABA is a neurotransmitter that helps to manage stress. It is advised to only take one Neuro-Natural range product at any given time, at the full dose. However, you may take a half dose of any 2 Neuro-Natural range products to suit your needs.